Earlier this year Intel confirmed that it would delay mass production of 10nm CPUs to 2019 due to issues with yields, but did not elaborate on when in 2019 that would be. Late on Thursday Intel finally made a long-awaited clarification: the first systems powered by 10nm CPUs will hit store shelves in the second half of 2019. But there is a catch: 14nm products will still continue to play a big role next year. Intel is set to start mass production of processors using its 10nm process technology in 2019, and while the company isn't explicitly saying when mass production will begin, it's sounding like that will be in the Q2/Q3 time frame. This being based off of what Intel is saying, which is that they expect to have PCs based on these chips to arrive during the 2019 holiday shopping season. Given the kind of lead-time required to get complete OEM systems on to store shelves, this would mean that mass production on chips needs to start 3 to 6 months sooner than that. As for said finished systems, what's typically considered the holiday shopping season starts in October or early November. 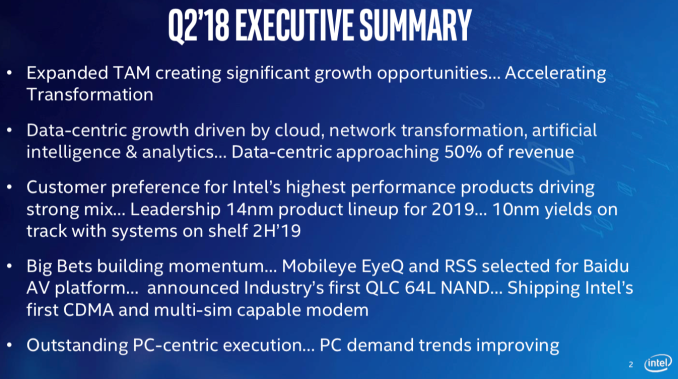 So systems based on Intel’s 10nm CPUs would finally be available in mass quantities starting in Q4 of 2019. 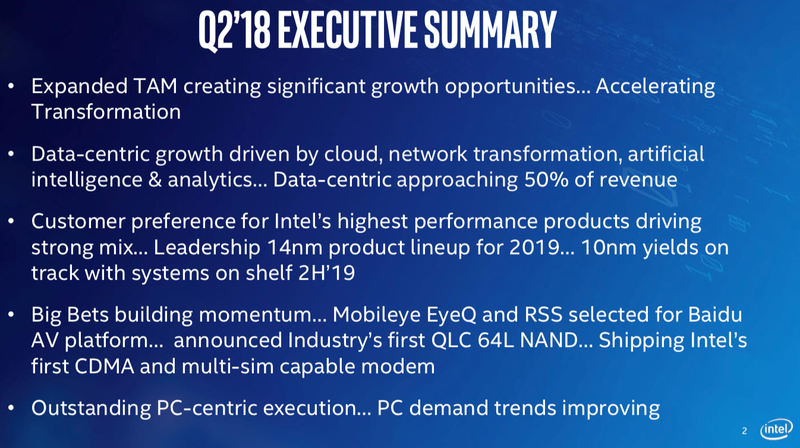 Consequently, for more three quarters of next year Intel will continue to rely almost entirely on its products made using its various 14nm process technologies. It remains to be seen how much time it will take Intel to ramp up production of its 10nm CPUs and when the volume crossover between 14nm and 10nm chips occurs. At present, Intel seems to be optimistic about what it has today and will have tomorrow — a variety of 14nm products. In fact, there is a lot of room for growth here: shipments of Intel’s Xeon Scalable processors accounted for a little less than 50% of Intel’s datacenter revenue in the most recent quarter, so the company will certainly continue to ramp up shipments of these products for many quarters to come, increasing its ASPs and revenue. Keep in mind that Intel’s upcoming Cascade Lake-SP platform will bring support for 3D XPoint-based Optane DC Persistent Memory DIMMs, which will bring in huge earnings opportunities to the company. Speaking of datacenter products. Murthy Renduchintala, Intel’s chief engineering officer, promised that 10nm “datacenter products” will follow “shortly after” availability of client systems running 10nm CPUs in the late 2019. He did not give any exact timeframes, but stressed that its next-gen Xeon will follow its next-gen client parts quicker usually. Essentially, Intel confirmed this week’s report claiming that the codenamed Ice Lake-SP CPUs may hit the market in Q3 or Q4 of 2020. Note: Image of a wafer is for illustrative purposes only. On one hand, I think Intel has given away their lead unnecessarily; it looks like Zen 2 (and by extension, EPYC 2/Rome) will lead Icelake capable systems by at 6 months or so. Intel uses a lot of tricks to increase their profits. No one should actually be worried about whether or not they have a competitive product. They can add more hyper-threading. They can unlock all CPUs. They could solder, they could include better coolers (quieter fans and larger heatsinks). Seriously, a 4C/8T 15W CPU that's faster than most of the first-gen Ryzen 3's and 5's running at 65W, and as fast or nearly as fast as their second-gen Ryzen 3's and 5's running at 35W. And per usual, Intel is just icing AMD in single-threaded performance (mostly due to the lack of app optimizations, not CPU architecture) but the fact still stands: Intel will always have higher performance per watt in mainstream mobile and desktop. That's the hard truth. That doesn't mean AMD isn't competitive. Intel still outrageously overprices their products (because they can) and AMD is in a better position than they have been for nearly 20 years. The Ryzen 2500U (also 15W) is indeed slightly slower on the CPU (not GPU) side. Intel cannot have too much confidence in Ice Lake and its successor (Tiger Lake), otherwise they wouldn't have hired Jim Keller to design Ocean Cove (presumably their first truly new architecture since the Core architecture was released back in ~2006, the fundamental design of which is still employed). Actually the Ryzen and Intel chip in mobile are pretty similar in speed. Also Ryzen has better integrated graphics. > Nvidia isn't sitting idle.